Today, The Pokémon Company International began the process of introducing its competitive player base to the structure of the 2018-19 season. The information revealed is notably incomplete, and what we did receive is long overdue, with a new stipend structure inconveniencing (to put it mildly) several top players. But we can start to piece together what changes TPCi has decided will be best the competitive scene over the next twelve months. Regional Championships and Special Events (combined) now have a Best Finish Limit (BFL) of eight. This means that only a player's eight best Regional placements will provide CP towards their Worlds invite. (E.g., if you earn CP from ten Regionals, CP from the two lowest placements will not count.) Back in June, Christopher Schemanske, one of the game's foremost experts on competitive play structure, wrote that he believes a BFL will be "a conceptual charade that will achieve nothing." 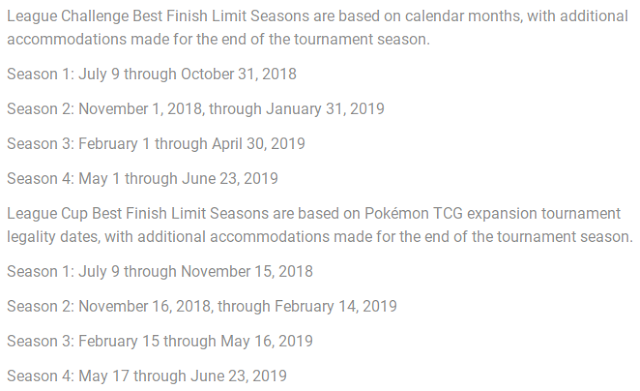 TPCi apparently believes it will solve at least some of the problems players experienced in the 2017-18 season, so we will see to what degree it proves effective. This is problematic, to say the least, for multiple players, due to the fact that this structure was announced after July 8th: thus, players had no clue that they were playing for 2018-19 travel awards during the last quarter of 2017-18. James Arnold, just outside the Top 16 cutoff in the table above, noted that he would have likely attended Mexico City Regionals if he'd known a strong finish there could have earned him a stipend for the 2018-19 LAIC. Rahul Reddy, outside of Top 16 by a hair, said he would have scooped to fewer players at League Cups toward the end of the season if he'd known about the new structure: by being a "nice guy," he put himself out of contention for the LAIC stipends without having any idea that he was doing so. In the view of most players, the biggest problem with today's announcement is not the structure itself, but the unprofessionally late timing of the announcement. "In the 2019 season, awards for travel to the International Championships will be based on stand-alone qualification periods." This ends the "snowball" structure of last season, where stipends were awarded based on CP earned cumulatively across the entire season. That structure let Top 16 players (to use the North American example) use International Championships to further bolster their lead over non-Top 16 competitors: if you didn't qualify for International stipends and couldn't fly to one on your own, you fell further behind in the race to earn stipends for the next one. Reaction to this announcement has trended positive but some players are unimpressed. Top German player Marc Lutz, already notably disgruntled with the 2017-18 structure, announced that "TPCi [likes] it better when people highroll at one tournament instead of what we had before," and promptly announced his retirement from the game. We don't know the cash prize structure for Regionals, Special Events, or Internationals. It appears that the CP award structure for each of those events is unchanged from the 2017-18 season. Detailed information on travel stipends has not been announced. Players considering playing for travel awards do not know what awards, specifically, they'll be entitled to. The invite qualifications for the 2019 World Championships are currently unknown. 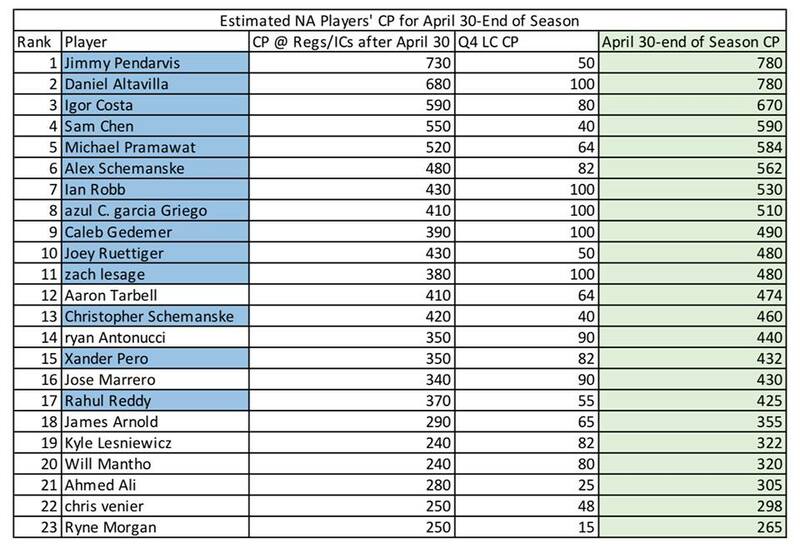 TPCi has not announced whether 400 CP will remain the cutoff for Worlds invites, or whether a new number will replace it. Rahul Reddy has said that he "expects 500" CP to be the new requirement. This post will be updated and edited for clarity as new information becomes available.